Sno-Way'spatent pending Energy Interruption System™ is the ultimate innovation in plow lighting. The relay/module-free design, with military spec electrical connectors, eliminates corrosion and makes installation a snap. 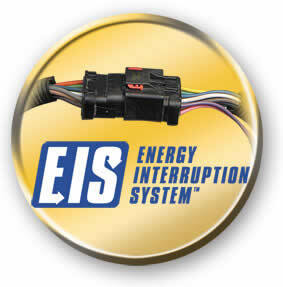 And, EIS™ is so simple, the locking connectors only plug-in one way for a secure, weather tight connection. EIS™ greatly reduces the time and complexity of Sno-Way snow plow installations simply because there are no relays or modules. And, you can forget about stocking those expensive replacement parts and eliminate job site down time. The Energy Interruption System™ is a closed system. The military spec electrical connectors are weather tight to keep out salt and moisture. Even when your snow plow is removed from the vehicle, the EIS™ connectors lock together as sealed weather caps. EIS™ is so simple, it takes merely seconds to connect or disconnect the plow lights to your vehicle. The locking connectors provide a positive fit in all weather conditions and the mating faces can only plug-in one way. Plow lighting has never been easier!